One day as Aeriel and her mistress Eoduin are gathering blossoms for an upcoming wedding ceremony a nightmare descends upon them from the skies. 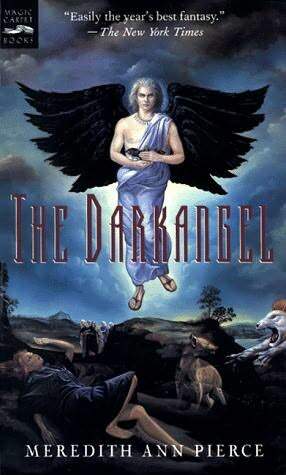 He is the Dark Angel and he has come to steal Eoduin away and make her his bride - a death sentence, as he drains the life from his wives, leaving them soulless wraiths. When they learn what's befallen their daughter, Eoduin's parents decide to sell Aeriel. Knowing it's unlikely she'll be lucky enough to find another kind mistress, Aeriel runs away to the mountain where Eoduin was taken. There she decides she'll either die of starvation, or die trying to avenge her friend, should the Dark Angel return. Well, he does return, but instead of death or her vengeance, Aeriel finds herself carried off as well. The Dark Angel has decided she is to be his wives' servant, sewing for them until the next year, when he takes his last bride and will reach his full maturity and be ready to fly with his brothers to divide the world between them. As she sews for them, the soulless and mindless wraiths beg Aeriel to free them, by killing the Dark Angel. But the more time she spends in his castle, the less she fears what's around her, coming to pity the wraiths, the starving gargoyles, and even the Dark Angel himself. Soon, the pity turns to love, despite his evil, and Aeriel isn't so sure she can bring herself to kill him. There were a few interesting concepts in this book but that's pretty much it. Plus, she's an idiot. His reaction, at one point, to a story she's telling him, pretty much gives away the secrets surrounding his identity but it's not until a hundred or more pages later that Aeriel figures it out. Were we supposed to be surprised too? Because once she had finished telling him the story, it was pretty obvious who the Dark Angel was. You know, I can't even remember what I found interesting in this book at all.